Almost 1400 years ago, Madinah became central power hub for Muslims after forced migration of Holy Prophet Muhammad (PBUH) from Makkah to this city. Islamic empire, in its first century, expanded exponentially from Madinah. It’s second holiest place for Muslims after Makkah and it contains a number of significant Islamic historical sites. I have visited these places several times and would share my experience with you. 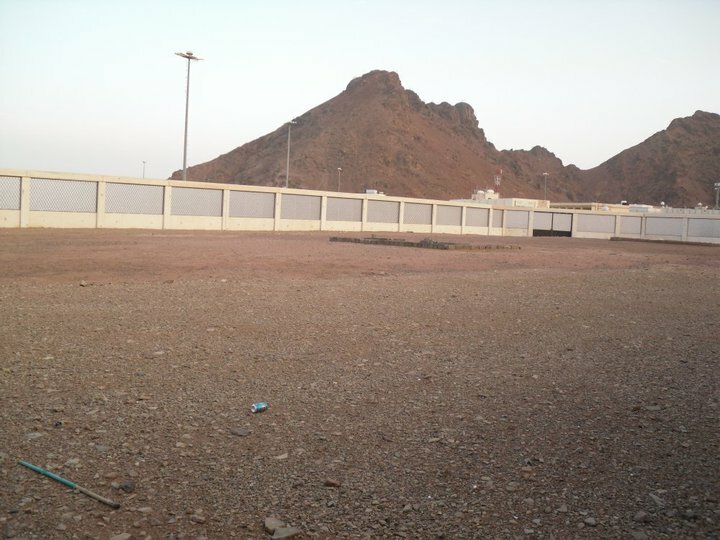 The mount Uhud gains significance as Islam’s second battle, between defending Muslims of Madinah and attacking infidels of Makkah, was fought in its vicinity. Though Muslims were heavily outnumbered yet they got early initiative and pull the invaders back. When victory was just a hand away, Muslim archers made a serious mistake by leaving their assigned positions despite the orders of Prophet Muhammad (PBUH) and that almost turned the game. A cavalry unit of Meccans, led by Khalid bin Walid (who later embraced Islam and became one of supreme Generals in Islamic history), made a surprised counter attack seeing that the guard post is vacant. That made chaos in Muslim ranks and a number of Muslims were martyred including Hamza (RA) who was uncle and foster-brother of Holy Prophet Muhammad (PBUH). Mount Rumah (in front of mount Uhud), It’s a small hill. It’s the place where Holy Prophet Muhammad (PBUH) instructed archers to take positions and not to leave the place without his orders. Part of Mount Uhud in background. A mosque has been constructed at the battle place. One can also see a number of vendors / hawkers of different small items awaiting visitors. Photo taken from Mount Rumah. 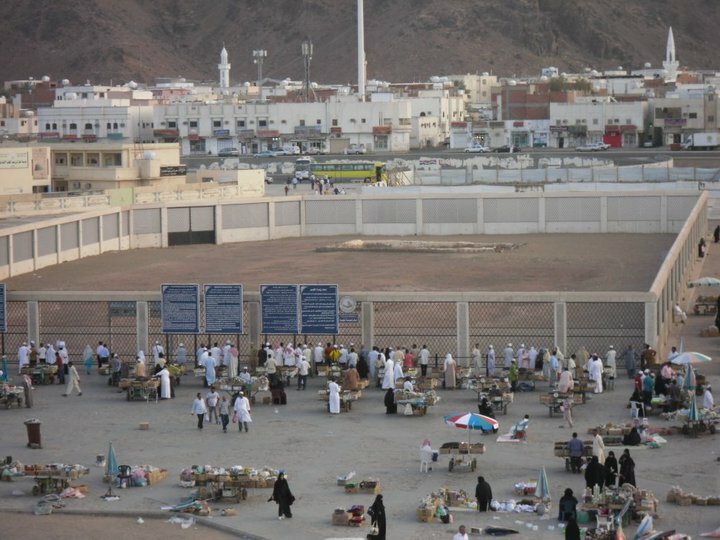 Graveyard of martyrs of Uhud battle. Holy Prophet Muhammad (PBUH) instructed to bury them in same condition (covered with blood) they had fallen. Photo taken from Mount Rumah. A closer view of graves. 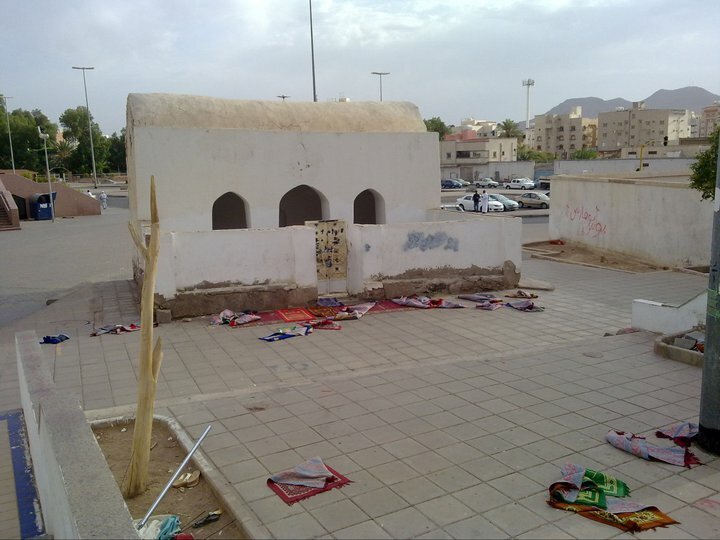 Hazrat Hamza (RA), uncle and foster-brother of Holy prophet Muhammad (PBUH) is also buried here. The battle gets its name as Muslims of Madinah dug a trench to safeguard themselves from a heavy army of Meccan infidels and Jews. The battle was fought in year 05 AH (627 AD ). Around 10,000 armed men with 600 horses and camels invaded Madinah to uproot Muslims. Muslims were just 3,000 in numbers and were inferior in arms compared to invaders. Holy Prophet Muhammad (PBUH) gathered people of Madinah to discuss best strategy. Finally, he accepted the suggestion of hazrat Salman Farsi (RA) to dug a trench around North end of Madinah as line of defense. The other parts of city were surrounded by mountains or trees providing natural fortification. All including Prophet Muhammad (PBUH) took part to dig the trench. Upon reaching Madinah, invaders siege the city. The siege continued for approximate two weeks but they were unable to cross the trench except for a few who were killed. Ultimately, they had to retreat and return back to Makkah. The place is also known as seven mosques. These are small old mosques in a row. 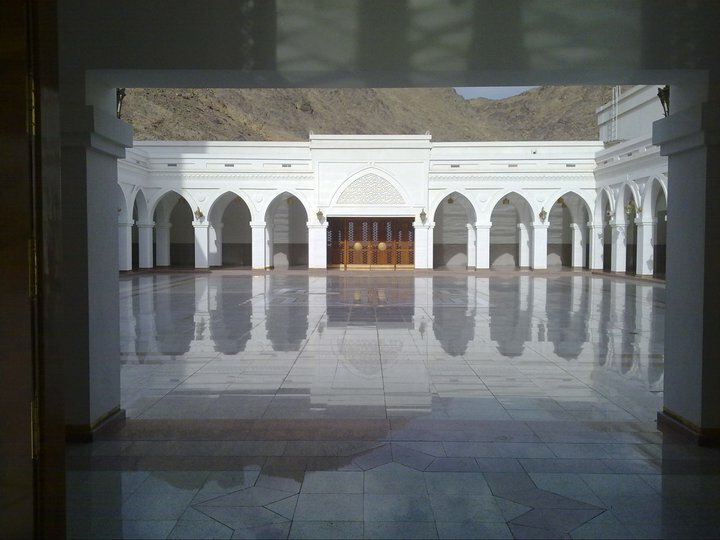 The doors of these mosques are locked and are not open to public. 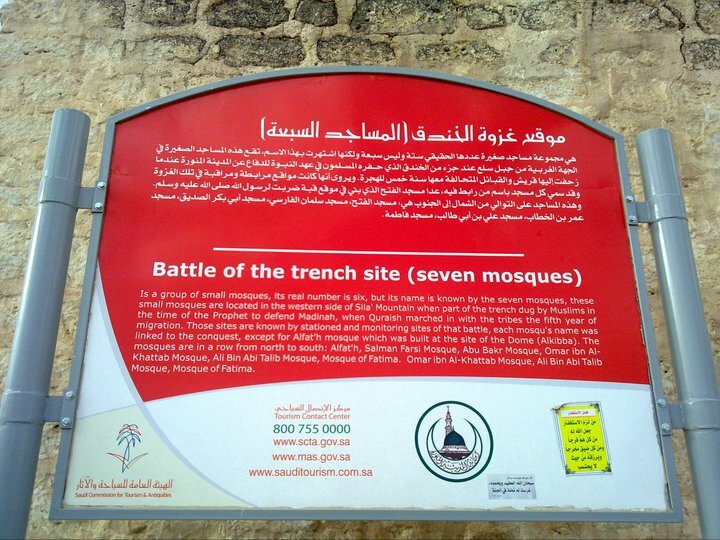 A new mosque has been constructed at the place where battle of trench was fought. It is open to public. An inside view of mosque. A board at the place with short description about incident. Good Job brother keep it up. coordinates for a place are more helpful to visite. Good to know that my work is helpful. thanks. I also read in a book about Middle East history that the Prophet Muhammed was invited to Madina by leaders of Jew and Arab tribes to solve conflict. You are partially xorrwct. In fact a group of madina’s people embraced islam in earlybyears of Islam and next year another group from madinah came to makkah to accept islam. so situation in madinah was in favour of muslims. On the other hand, teibes of makkah were against muslims. They even made a plan to kill holy prophet Muhammad. It was then, by prder of Allah, holy prophet migrated to madinah. I have a few pictures from my Makkah and Madinah trip last year. Would share sometime. I visited Ghar-e-Hira during this trip which was quite a spiritual experience. I have also visited cave hira but didn’t go up to the cave. Just climbed hall of the hill and returned back to go to cave thawr.